Happy Friday! What a week this has been- one day I'm running in shorts and another day I'm ice skating down the road. I think my bus driver said it best when he said "That dang ground hog doesn't know what he's talking about". Let's hope that next week we have warmer weather! 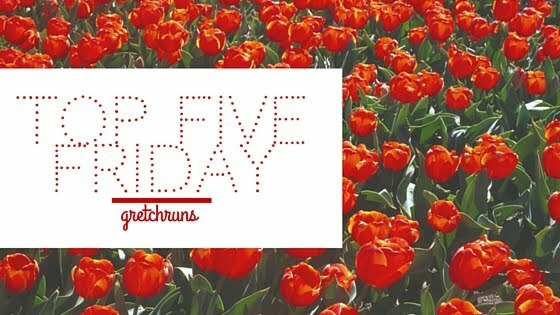 What do you think about my new springy Top Five banner? I thought I was due for a new icon, and I loved these flowers, and hope it will convince the weather to warm up. I hope you like it, and now let's get into other favorites from the week. If you're a fan of Amy's comedy, or obsessed with Hamilton like 90% of the world right now, you have to watch this skit! Even Dan loved it, and he's not really a fan of either. Amy is so clever and I love her style of comedy. Make sure you check it out! This week, I semi-accidentally went makeup free! On Monday, I was running late and didn't have time to apply any makeup, so I brought it with me to work. I ended up being busy all day and not applying anything- and now it's been five days of no makeup! I don't wear a ton to work (you can see my makeup routine here), but it was still a big deal for me to not apply any foundation or concealer. Not only am I saving a ton of time in the morning, but my skin has completely cleared up since I'm not covering it in product daily! If you haven't tried a makeup free week, I would suggest giving it a go! Who else is a baseball fan out there? I absolutely love baseball season, because games are fun to watch, and it also means that warm weather is right around the corner! My favorite team is, of course, the Pirates, who are off to a terrific (undefeated) start. Not bad! Who do you cheer for? I've tried a lot of recipes from Margaret's blog, and everything has always been so delicious and easy to make. I was intrigued (and to be honest a little scared) about this recipe at first. I mean, I love pineapple, chicken, cashews and coconut- but all together in one dish?! I decided to give it a try though because pineapple and chicken were both on sale, and I had some cashews and coconut milk to use up. this is my all-time favorite! I use the dark brown version which is lightly tinted, but all of the varieties are fantastic! I love this eye cream! It has a sheer salmon color and is pearlescent, which helps to subtly cover and brighten dark under eyes. It's also really hydrating and lasted me a really long time, so I recommend this! my favorite perfume! If you like musky, rich scents give this one a try. I love using roller balls so I can control how much I apply, and I already have 2 backups of this one so I'm never without it! I love this mascara so much. It gives a ton of length and volume! It does tend to get a bit clumpy, so I either run a metal comb through my lashes or follow up with Clump Crusher. I have pretty thick eyebrows, so luckily I don't need to fill them in. They do get pretty unruly though, so I like to run this clear gel through my brows to keep them in place. This one is fantastic! I'm finally finished with all of the products in the Sun Safety Kit by Sephora from last summer! I loved every product and this is my favorite sunscreen in the kit. It didn't break me out, protected my skin, and worked perfectly under makeup. I'm definitely going to be buying the kit again this year- it was such a great deal! What recipes have you been trying out lately? Any other baseball fans out there? I have my fingers crossed every year for them :) Have fun in NYC- sounds like a blast!! Ah Gretchen stop you just made my day! You are so sweet to say all those words! I'm just so happy you and Dan enjoyed it! You look so beautiful without make up, you don't need any of those products! I should have done no make up week in my old job where no one looked at my or cared. Now that I started this new one I have to dress nicely, do my hair, and wear at least a tiny bit of make up every day because we have corporate visitors all the time and I need everyone to think I'm older than 24! I'm hoping to get to a pirates game this season! And dry shampoo is a staple for me! I hope you make it over! i love that batiste--one of my FAVES!! Happy Friday! Love Amy Schmumer but have no idea who/what Hamilton is. I'll have to watch it and see! You totally don't need makeup. You look great! But if you do want to wear it and it breaks you out, you should try organic. A friend of mine had severe cystic acne and tried everything--the really bad creams and pills prescribed by a derm. Finally she tried organic skincare and makeup, and it totally cleared her up for good! HOW ARE YOU GOING TO LIVE WITHOUT DRY SHAMPOO?? Girl you know I have backups haha! That's a bummer! I lived in Cleveland for a summer (and was working for Progressive who owns the park!) so I went to tons of games! I am a massive baseball fan. The Braves are my pro-team. But I love any kind of baseball. I am a regular at college baseball games. That's so cool! People usually tell me how boring baseball is but I love it! I don't pack makeup when I'm visiting family. If we don't have anywhere fancy to go to, I figure they saw me before I started wearing makeup, and there's no point in getting dolled up. Exactly! It's so much easier to go makeup free and not worry about bringing a bunch of stuff. I've always enjoyed the process of putting on makeup..it's more of a relaxing thing for me than anything else! Sometimes when I'm bored on the weekends I'll just spend an hour playing around with new eyeshadow looks or something. But I agree..it definitely can be a comfort thing! I'm meeting my childhood friend Renata today! I'm so excited!! She's the loveliest human on the planet. And we've had obscenely warm weather so it's all about shorts over here. Yahoo! Lucky..send some of that warm weather down here! Thanks so much for stopping by Morgan! Since I'm a SAHM and I just do not care, my life is a makeup free week ahah! To be honest, my hubs can't stand when I wear makeup, so I don't really bother unless we're going somewhere and I know I'll want a picture. Same here! Dan hates it and thinks I'm much prettier without makeup. I'm about to run out of eyebrow gel, so I'll have to check out your suggestion! This weekend, I'm heading out for a 10 mile run as part of my half marathon training, then celebrating some good news with a friend Saturday night and brunch Sunday! Hoping for good weather--it's been cold in Nashville too. I love baseball!!! I don't wear much makeup to work either, but that is awesome that you went completely makeup free... my skin is much clearer when I don't wear makeup too. It is in the 80s in Dallas!! Ugh send some of that up here! I'm always super keen for new recipes so I'm going to give that one a go. I'll be honest, the pineapple is making me nervous too but if you say it works, I'll be brave! And my husband is a big pineapple fan so I'll take one for the team. Batiste has saved me on countless occasions, I get through so much of that stuff. Also I'm always on the lookout for good sunscreen so I might check that one out. I'm coming to the US in the summer and I'm going to be hitting Sephora SO HARD seeing as we don't have it here. That's going on the list! I've been meaning to try Margaret's cashew chicken recipe! Hopefully next week I'll give it a try! This weekend Paul and I are headed to Milwaukee, WI for a little trip so I'm excited. Aside from the fact it's going to be a high of 36 tomorrow.. we were hoping to sit outside at a few breweries haha maybe not anymore:) Have a great weekend! Girl!! way to go on the no make up! You are beautiful, no need for make up! I was having a dream of dry Shampoo... maybe this is a sign I need to buy some. I'm looking forward to running my last long run before the Marathon, I have 23 miles schedule for Sunday! I'm obsessed with that dry shampoo! I only have to wash my hair once a week using it! Baseball! So glad it is back. I'm a Mets fan, but love to see other teams and ballparks when I can. I have cousins in Squirrel Hill, and yet somehow have never managed to get to a Pirates game. It is on the list, but it always seems that when I am out there for family stuff every couple years, the timing just doesn't work out. One day!! I've been going make-up free for I think a couple years now, except for special events. It's mostly because I'm lazy but I love not having to worry about it in the AM. I saw a quote from someone once saying she stopped wearing make up because she wanted to spend less time looking in mirrors and more time looking out at the world around her and I thought that was really profound. I'm not really into baseball, but when your significant other is a PGH boy and Buccos fan, they (and the Penguins, and the Steelers) are inevitably part of my life, lol. It's crazy how much free time I have in the morning now :) I love it! I love that quote..thanks for sharing it Hanna! Yay for a makeup free week! I only ever wear makeup when I have a work meeting or I'm going to church as I don't really feel like I have to "put my face on" before going out! My skin is definitely much happier when I don't put it on too! I need to check our Hamilton! Haven't listened to the soundtrack yet. I normally don't wear makeup on the weekends (unless we're going out which is rare) & it feels so good to get all that crap off my skin for a minute. Now that it's getting warmer out, I'm definitely thinking about switching to some lighter products. I was wondering about that Loreal dry shampoo but I'm not surprised that it wasn't any better than Batiste! I haven't found anything better than that stuff! I don't watch a ton of baseball but games are so much fun. I'd have to say that I'm a Royals fan though! :) Have a great weekend! I definitely switch up to lighter makeup in the summer, mostly because everything melts off anyway! Elizabeth and James Nirvana Black smells so good! I not on purpose did almost makeup-free for my first trimester. I was just plain too tired for that business. The saved time in the morning was amazing! Although now that I have more energy, I wear it unless I'm having a pajamas at home day. Your skin really does appreciate not having makeup, though. I haven't heard that one! Thanks for the suggestion Edye! you look beautiful with no makeup on!!! Your eyelashes though :) Love baseball season, so fun to go to games! Blushing :) Thanks so much Caitlin! I am obsessed with batiste too! love the stuff. Batiste is my all time fave! and seriously you look fabulous with no makeup, you should totally rock it all the time. that is awesome your skin cleared up! Great line up of faves- pinning!